This classic needlepoint reference is finally available again, and this time in a full color edition. 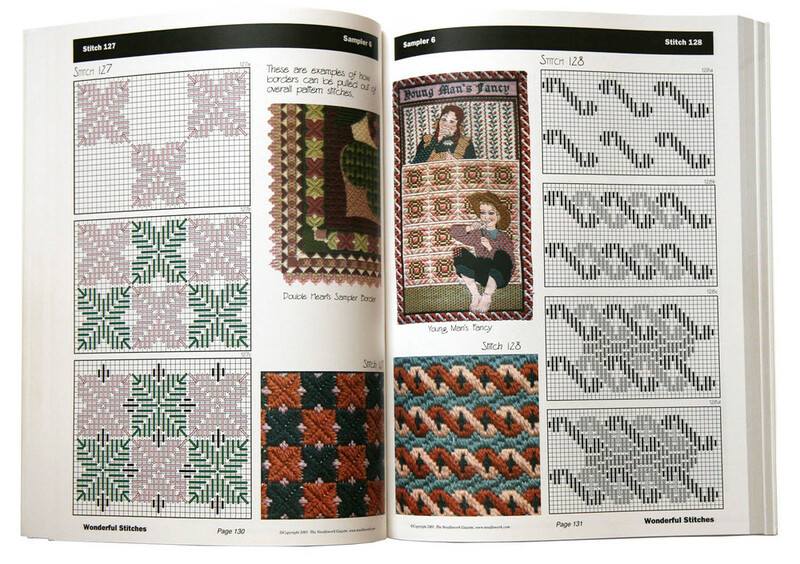 Wonderful Stitches contains a lavishly illustrated collection of 320 decorative stitches, with many examples of their use. The book diagrams the stitch patterns in a step-wise manner starting with a framework layer that then guides the rest of the stitches with less counting required. There are many illustrations of Diane's projects showing the stitches in action (a few of which can be seen on our gallery page). Decorative stitches can add subtle texture to an otherwise plain background, be used to create fancy borders, add dimension to flat surfaces and richness of color and pattern to areas otherwise filled with a single color. Click picture to view our LuLu store and view the book preview. Wonderful Stitches is a Publish-on-Demand book printed by LuLu Press. It is printed full color, 308 pages, perfect bound. ISBN 978-0-9710589-1-0. This is a much richer book than earlier versions published before 2008.